Oliver, BC (April 21, 2017) – Miradoro at Tinhorn Creek, awarded Best Winery Restaurant in the recent 2017 Golden Plates Awards, is gearing up for an exciting collaboration between two of British Columbia’s most celebrated culinary experts. On May 5, Chef Jefferson Alvarez from Vancouver’s Cacao Restaurant will join Chef Jeff Van Geest in the Miradoro kitchen to co-create a unique Spanish style, local ingredient-led multi-course gourmet dinner, paired with Tinhorn Creek wines, Cannery Brewing beers and Dubh Glas Distillery spirits. Executive Chef Jeff Van Geest takes great pride in keeping his ingredients close to home. Between fresh bounty sourced from local farms and herbs and vegetables plucked from Miradoro’s very own backyard, Van Geest’s wine country cuisine is just as authentic as the spectacular South Okanagan region that inspires it. Guest Chef Jefferson Alvarez is also no stranger to culinary excellence. His extensive experience in the Executive Chef role and hosting pop-ups all over the city paired with a close connection to his Venezuelan roots have helped make his latest venture, Cacao, such a sensation. With a commitment to fresh ingredients and an irrepressible Latin American flare, Cacao is an entirely new blend of modern and traditional cuisine. 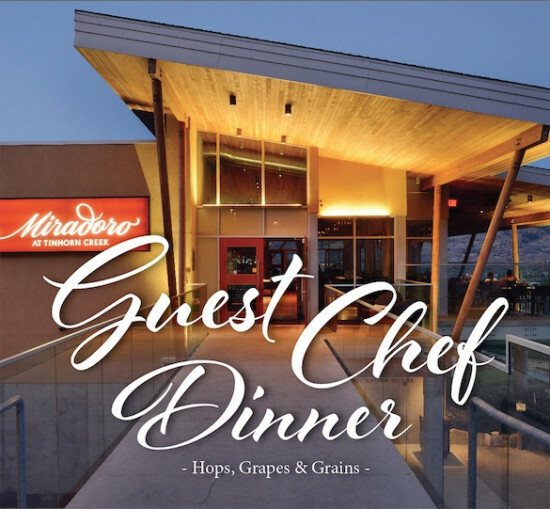 Guest Chef Dinner – Hops, Grapes & Grains, will be held on Friday May 5 at 6.30pm and will bring an exclusive curated menu to Miradoro for one night only. The multi-course menu features five signature Spanish-style dishes, including pappas arugadas with seaweed salsa verde followed by rib steak with a unique Latin American flare. Each course is paired with premier wines from Tinhorn Creek, craft spirits from Dubh Glas Distillery and Cannery Brewing beers for a delightfully engaging culinary experience. Seating is limited and reservations are required. The dinner costs $125 per person, fully inclusive of taxes and service. Call 250.498.3742 or email info@miradoro.ca to book.